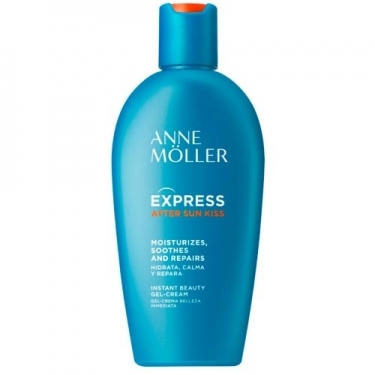 DESCRIPTION: Express Double Care Aftersun Kiss from Anne Möller is an instant beauty cream gel for post exposure to the sun, with illuminating particles that reflect the light and sublimate the tan of your skin. A complete care that helps to calm, rehydrate and repair your skin, while still activating its resistance to the sun's rays. Rapid absorption and refreshing texture, which gives a velvety touch to the skin.